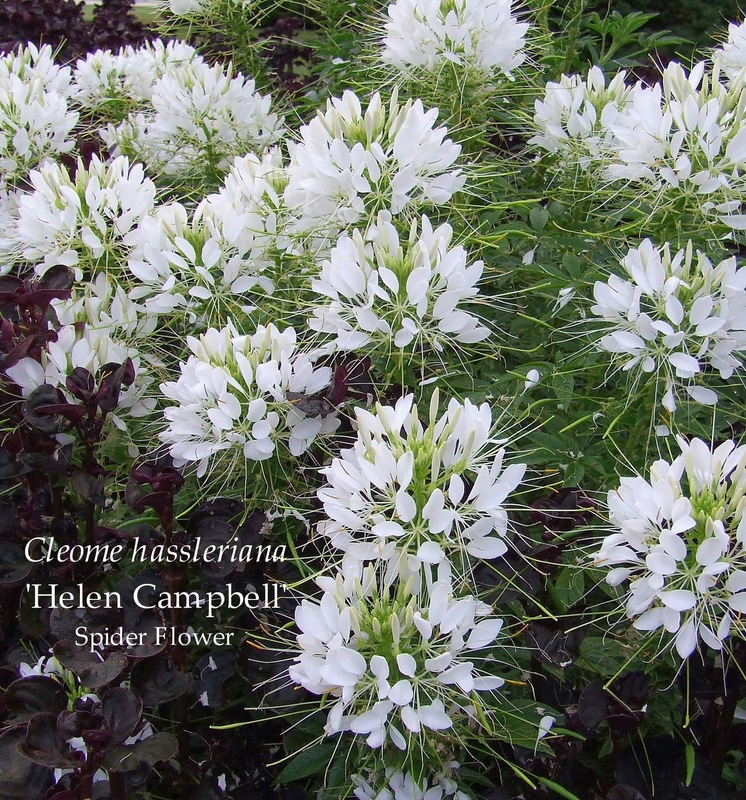 CLEOME, Spider Flower, Spider Legs, Grandfather's Whiskers, Cats Whiskers. 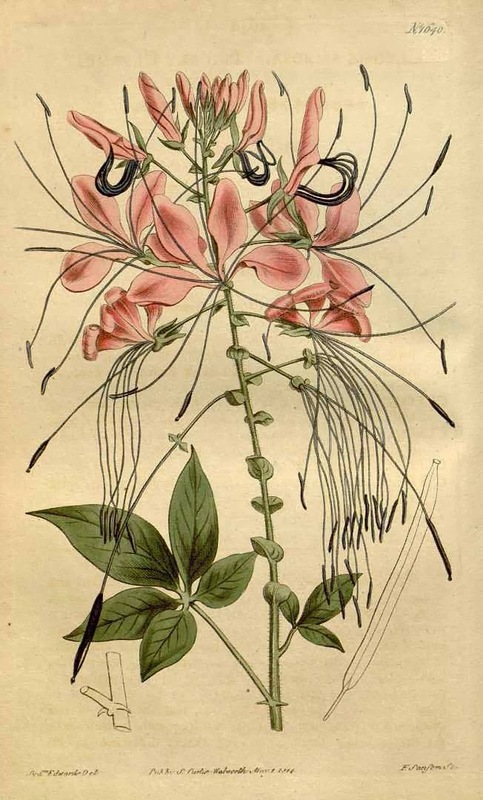 This is undoubtedly the same plant that is described and figured by WILLDENOW, under the name of CLEOME pungens, in his Hortus Berolinenfis ( Berolini, Apud G. Reimer,1827-33); but we see no reason to support it to be distinct from CLEOME spinosa of Linnaeus. The author himself observes that they are very similar, but that this differs in being more lofty and in having constantly five, never seven, leaflets, and in being clammy. But the latter circumstance is particularly mentioned by JACQUIN, in his description of spinosa; and Mr. Anderson assures us, that the leaves of our plant, when young and vigorous, had frequently seven leaflets. As to the height there is no remarkable difference in his account and that of JACQUIN, if there were any weight in such a distinction. 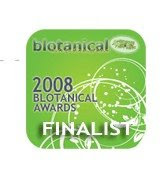 Though generally considered as annual and indeed usually flowering the first year, yet in our stoves [Ref 1] it is a perennial, or at least a biennial, and blooms perfectly in the second year. Native of the West Indies. Cultivated by MILLER before the year 1731. Flowers in July and August. Propagated by seeds, and is constantly kept in the stove [Ref 1]. Our drawing was taken at Mr. VERE'S at Kengsington-Gore, in July, 1812. [Ref 1] Stove: To keep warm, in a house or room, by artificial heat; as, to stove orange trees. The older varieties blooms do have an offensive smell, self seed all over the place, are tall and leggy and have thorns. The more modern cultivars perform really well have a pleasant slight mint scent or none at all, they are thorn free and are little more compact, some are sterile. Technically a annual but sometimes can last two seasons around here depending on the severity of the winter and spring frosts. My advice is "Give them a home"!!! you will not regret it.